You know whats wrong with this picture?…..Not a damn thing!! 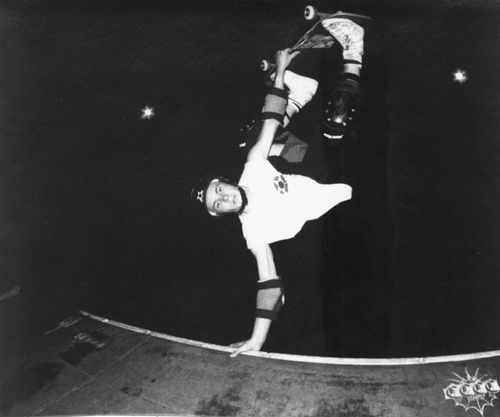 Another sic pic from Jeff Roenings Hillcrest ramp in New Jersey this place was like East Coast vert skatings Studio 54 in the 80’s….all the stars came out to ride. Also hello to all our new found friends from http://www.SkateDaily.net Chris and Bryce (dat”s right last name starts wit a “K”) are doing great things for the skate community and culture….check em out! I’ll give em a proper post explaining their radness soon. 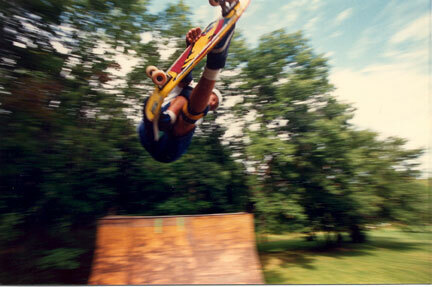 This entry was posted in 1986, Bryce Kanights, Chris Miller, Jeff Roenning, photos by Jeff Roenning, Roenning’s Hillcrest Ramp, SPOTS: and tagged ART, backyard ramps, boards, Chris Miller, east coast, jason, Jason oliva, jasonoliva, Jeff Roenning, New Jersey, New York City, oliva, paintings, photography, pool Skating, ramp, ride, sk8, sk8t, skate, skate decks, skate history, skate photography, Skate ramps, skate trucks, skate wheels, skateboarding, skateboarding history, skateboarding photography, skateboards, skatepark, skater, SKATERS, steam, Street Skating, TEAM STEAM, The Barn, The House of Steam, thos, vert, vert ramps, Vert Skating on February 20, 2007 by jasonoliva.